A stretch of the Erzen River will be diverted due to the works for the construction of the Tirana-Elbasan highway. We provided our channelling solution to create a new river bed and a geogrid reinforced soil structure. 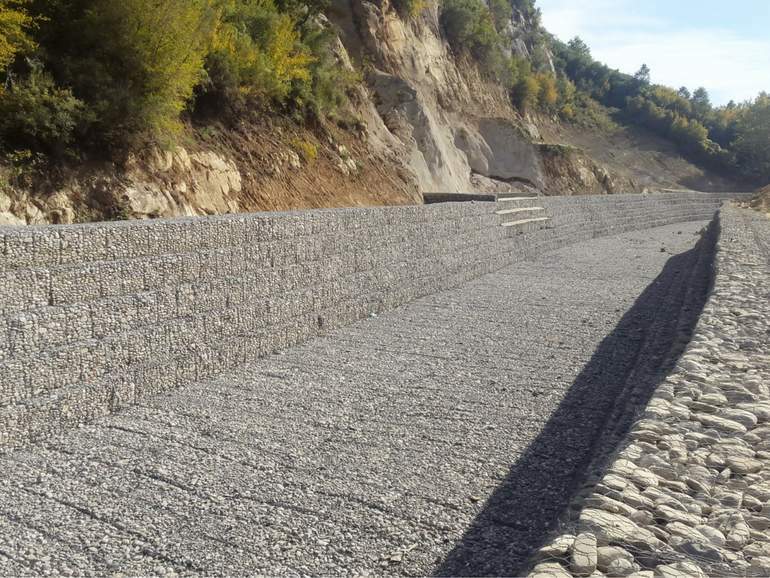 Our gabions will act as a protection against erosion and landslide hazards. The Tirana-Elbasan highway is one of the biggest and most challenging infrastructural projects in Albania. This four-lane highway covers the distance between the two cities of Tirana and Elbasan in the shortest way possible with a total length of 26 km and it will be part of the A3 motorway of Albania. Many geotechnical issues had to be overcome as the new highway passes through a very difficult mountainous region. A technical solution was needed in the vicinity of the Ibe village, where large landslides had occurred along the Erzen River. To prevent water erosion and protect the highway against further landslides, the construction company Copri-Aktor decided to reinforce the slope with a valley fill and divert the river for an about 550 m long stretch. A reinforced soil solution and hydraulic works were needed to create the new river bed and protect it from erosion. On this purpose, we were called to provide our gabions for the necessary channeling works. A 550 m long, 12 m wide and 5 m deep channel was constructed adjacent to the existing river bed. A 3 m high step was added along the channel for water energy dissipation. A soil reinforcement solution was also needed to stabilize the slope that was created by filling the existing river bed. Therefore, one of the banks was created with a MacGrid® WG geogrid reinforced gabion wall. The gabion baskets used for this project are made from high-quality steel wire which is heavily galvanized to provide long-term corrosion protection. In total we provided approx. 15,400 m³ of gabions (0.5 m and 1 m high) and 30,000 m² of MacGrid® WG geogrids. We have over a century of experience in water control and channelling structures. For more information on our channelling works solutions, please contact us.